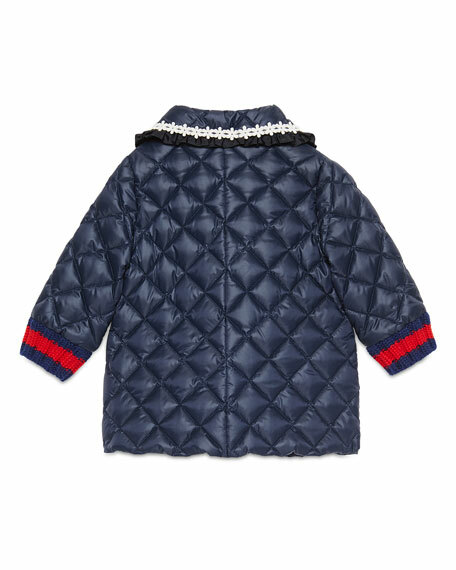 Gucci diamond-quilted coat with floral detail and ruffle trim. Rounded spread collar; three-button front. Long sleeves; ribbed web cuffs. Trench coat in allover GG canvas with lamb leather details & novelty GG buttons. Mandarin collar; button front. Long sleeves; button cuffs. Adjustable belt. Side flap pockets. A-line silhouette. Semi-fitted. Center back vent. Knee-length. Cotton/polyester. Made in Italy. 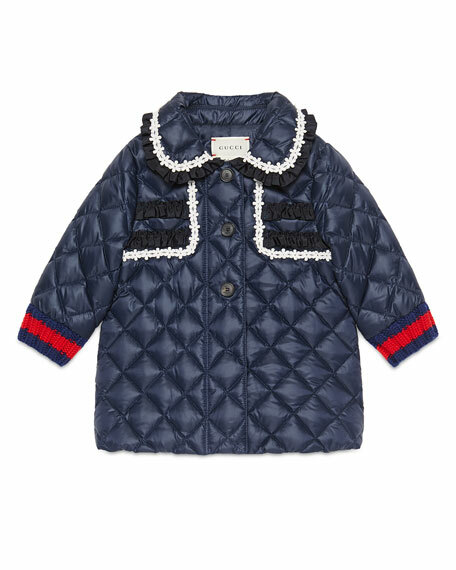 Gucci coat in wool cloth with contrast grosgrain trim. Peak lapel; double breasted front. Golden double-G logo embossed buttons. Front flap pockets Slim, A-line silhouette. Midi length. Lining embroidered with "Dans mon pays on m'apellait l'amour." Wool/nylon. Made in Italy. Gucci gabardine coat with Gucci game patch at chest. Contrast, faux-fur (polyester) collar and cuffs. Spread collar; zip front. Ribbed Web trim at hem. Long sleeves. Flap patch pockets at hips. V'd box pleat at back. Nylon; knit, wool. Made in Italy.